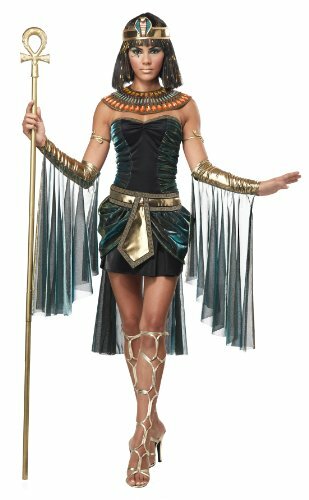 Looking for your own Egyptian Goddess costume this Halloween? There are plenty of powerful goddesses to choose from when deciding on an outfit to wear and below I’ll give ideas for a selection of the most popular including Cleopatra (of course), Egyptian cat and Isis. Ancient Egypt is many people’s favorite time period, it’s one most learn about as children in school and so it holds a fond memory. Learning about the mummies and how each king and queen is embalmed preserved for years to come is a fascinating concept for people of all ages. As well as featuring prominently in history classes, these great gods also showed up in art class and I could remember learning that each deity was drawn in the exact same way. In such way that wouldn’t be humanly possible, while their drawings may be out of reach their outfits are as popular as ever for fancy dress. 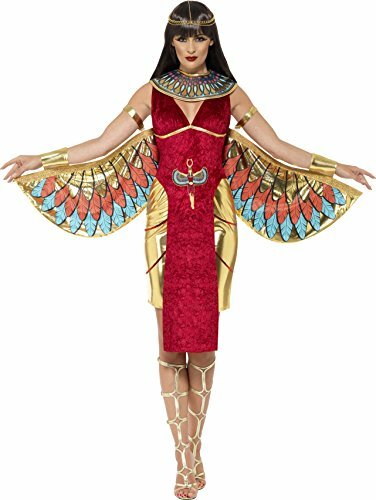 Cleopatra is by far the most popular women’s costume choice for this theme, she is a grand goddess known for being the last Pharaoh of Ancient Egypt. She’s popularized in modern media through the works of Shakespeare, art and literature. It’s not only being a Pharaoh that has people captivated by this historical figure but also the tale that says she took donkey milk baths in order to stay young and beautiful. This replica outfit features all you will need beside footwear including tan dress with attatched blue and gold belt, sequinned collar, blue cape, wrist cuffs and headpiece. It was not just ancient Pharaohs who were giving a grand farewell when they died, pets were also included including cats of course. Even thousands of years later cats remain a popular household pet and the Egyptians were no different. This rather sleek outfit bearing no resemblance what so ever to your everyday household cat is a perfect idea for this theme even better as part of a group with the sets below. It includes your black catsuit, colored neckpiece with drape and earband. Add a gold pair of footwear nothing less for a goddess and keep your hair in a short black bob to tie everything together. Even today there is still plenty of mysterious surrounding the death and burial of King Tutankhamen, he is one of the most well known Egyptian Pharaohs thanks to his famous pyramids. 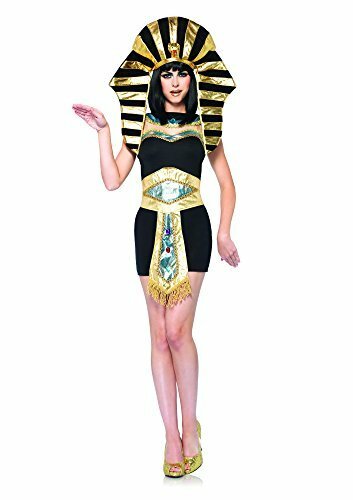 The queen tut outfit features all the elements of a King costume but includes the black, gold and blue dress with intricate embellished belt, neck piece and finally serpent headpiece. All you need to complete it is a pair of gold sandals or heels similar to the image, then strike a funky Egyptian pose similar to a chicken whenever someone snaps a photo. Don’t forget the look doesn’t end with a snazzy set of clothing, the Egyptians were also known for their makeup (even the men) and so your look will not be completed without the tutorial below. To recreate a similar cat’s eye look like the video start priming your eyes with a white eye pencil, rub this in to create your base shaping it into a cat eye so the other colors can ‘pop’. Dab gold glitter onto the primer. Then take an aqua blue liner to outline on the eyelid crease. Next use your black liner on the upper lash line make sure to extend the wing further than your natural lashes. Extend your eye towards your nose using black liner so your have it going both directions, take your time doing this as it’s easy to mess up. Glitter can make the liner hard to see so finish off with a black pencil. Don’t forget a final application of your favorite mascara. 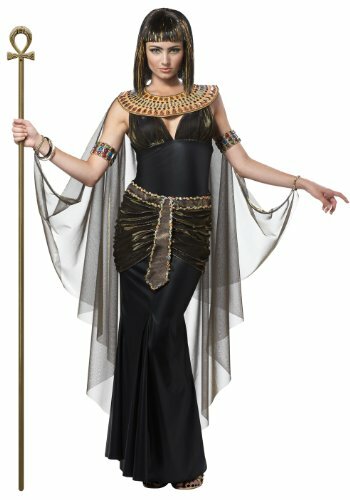 Who would not want to dress as an Egyptian Goddess. These costumes are great! Walk like an Egyptian! Wonderful costumes! !